This post is sponsored by Vital Proteins. All opinions are my own! I made this delicious drink right before leaving last week for LA and I’m pumped to share it with you. It’s super simple to make (my favorite), and only a few ingredients! I have about a million containers of turmeric in the pantry (conservative estimate). Since I’m part Indian by marriage, I felt it necessary to stock up on every Indian spice available and my mother in law also decided that I needed more turmeric than I could ever use. When was the last time I made Indian food you ask? Probably this one with the beautiful appetizing picture posted almost 2 years ago. Whoops. So I’m pretty pumped that the internet world is exploding with turmeric recipes such as golden milk and other ways to use the spice. I try and throw some into my smoothies here and there, since my blender has become a crazy mixing pot designed to use up various powders and veggies throughout the week. 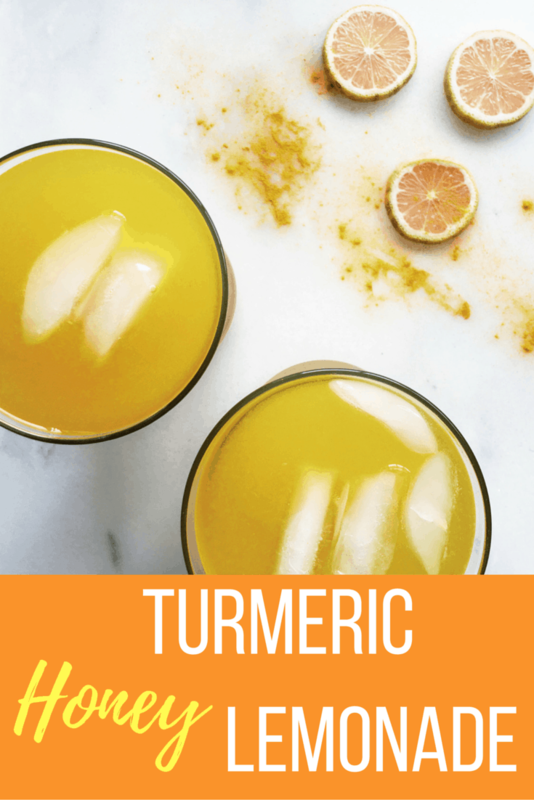 Turmeric is a powerful anti-inflammatory that has been used for years in Eastern medicine. You can read more about its benefits here. The other weekend during my crazy shopping trip at Mariano’s, I stumbled upon some wonderfully overpriced pink lemons. Neil informed me they were about 213456747 times the price of regular lemons, but I informed him that THEY WERE PINK AND NORMALLY THEY’RE YELLOW AND DIDN’T HE UNDERSTAND THE MAJESTY?? Sadly, when I cut them open, they were really only mildly pink and also the size of limes. Hmm. Point — pink lemons are not as cool as something like cotton candy grapes. While throwing this concoction together, I decided to throw some Vital Proteins Collagen Peptides into the mix. It’s unflavored and dissolves in hot OR cold beverages, meaning that I could drink this lemonade hot right after I made it or wait for it to cool down and not have to worry that the collagen would start to turn to gelatin, which is what it would have done if not in this nifty peptide form. Adding these peptides allowed me to get a quick dose of protein and amino acids, helping out my joints, hair, nails, skin, and bones. You may remember my recipe last month for dirty chai protein almond butter and I’ve still been using Vital Proteins almost every day in smoothies and am loving it still. Also, THAT PACKAGING. Swoon. 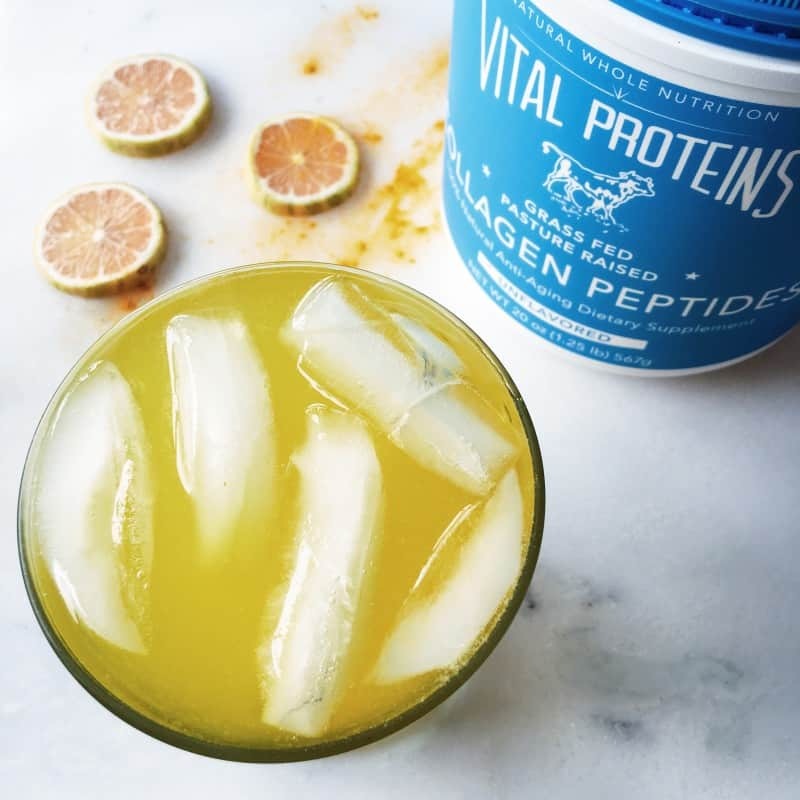 Obviously, you can make this lemonade without collagen, but if you happen to have any on hand, here is just another magical way you can fit it into your everyday routine. Enjoy! Boil water, then add into a larger container for mixing. Add lemon juice, honey, turmeric, and Vital Proteins and stir until dissolved. Start with 1/2 tsp of turmeric and add more as tolerated (has a very earthy taste). Either let mixture cool by placing in fridge, add ice, or drink warm. I did all of the above and they were delicious. There may still be some turmeric powder in the finished product, so make sure to stir or shake before drinking. You can also adjust the sweetness by adding more honey if you need to. Do you use turmeric? What do you make with it? What’s the last recipe you made? Carla recently posted…Im the eight percent. Yesssss. You could also just paint w it since it dyes everything as well haha. You know that I love and adore their collagen peptides! 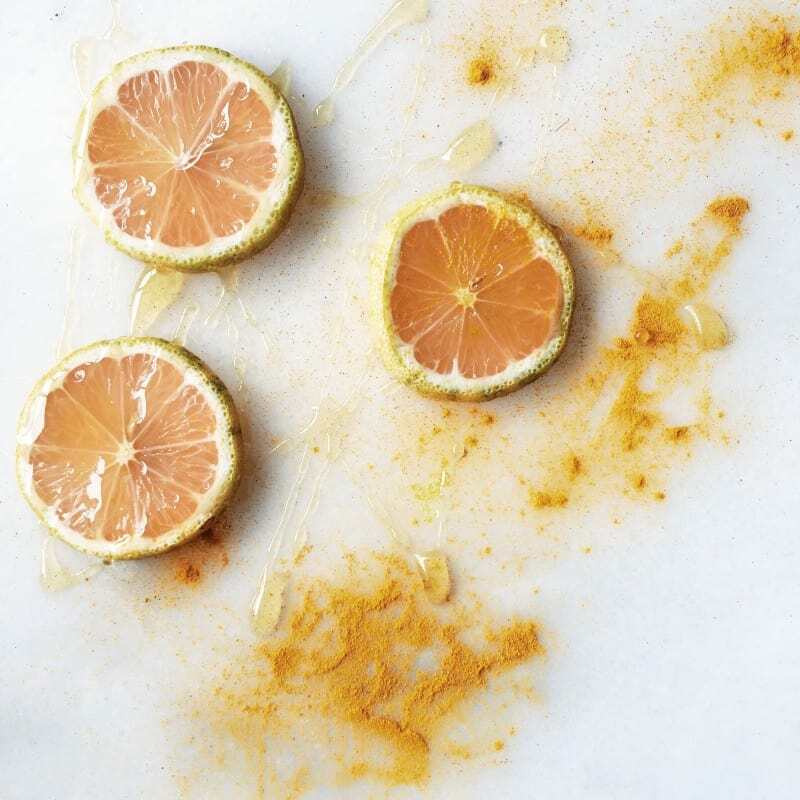 The flavor of tumeric added to lemon sounds wonderful. I was surprised how easy it was. Brilliant! This is my kind of lemonade. Happy Birthday chica! This looks awesome! I add tumeric to tofu to make it yellow for an tofu scramble. Can’t wait to try this one! Ooh that sounds so fancy! LOL I would’ve been the same about pink lemons. This sounds delicious 🙂 Happy Birthday! I’d still probably have gotten ridiculously excited about pink lemons, too. GO SCIENCE! I need to pick up more turmeric, but I love putting it in my smoothies in the morning. I don’t notice the flavour and I know it’s helping my body. Exactly! It’s good to just toss in there.